Many houses and businesses in London have UPVC doors, which stands for unplasticised polyvinyl chloride, because they are more durable, secure, and more affordable than traditional ones. UPVC doors can become very insecure and uneconomical without secure locks. Old or faulty UPVC door locks can cause a lot of problems, including lockouts. Although it is a very unpleasant experience when you cannot access your property, you can have a locksmith come out to provide access to your property. Whenever you will need to unlock your UPVC door in our service area, you can call AZ Locksmith security experts. We will come to you in the shortest possible time and help you quickly and professionally. We offer accurate and affordable mobile services on-site. Our licensed technicians work 24/7 and are reachable throughout our service area. We are specially trained to open all types of UPVC door locks quickly, without any damage. Our master locksmiths always avoid unnecessary work and repairs, thus saving you time and money. When do you need to repair your locks? One of the main reasons of a UPVC door lockout is a malfunctioning or an obsolete lock. Having faulty locks is also very risky, as thieves and burglars can open them easily. Also, if the lock is defective, it can make it difficult to open your lock and to stay secure as well. This problem can be solved quickly by the help of a professional locksmith without buying a new door. 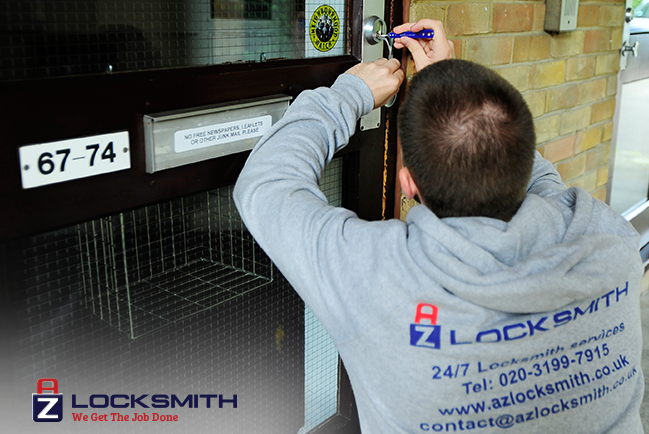 AZ Locksmith technicians are experienced in repairing any type of multipoint lock UPVC on-site timely and effectively. Sometimes a lock is beyond repair and it is necessary to install a new lock. Our master locksmiths are able to set up many types of high-security locks on UPVC doors. Do not hesitate to contact us and our security experts will determine what kind of job will be needed to be done according to your individual needs. Our licensed locksmiths use only top-notch products and tools to offer you fast and professional services at the most competitive prices in the area. We also offer you fixed rates with no hidden fees! In addition, all our products and services come with a 1-year warranty.